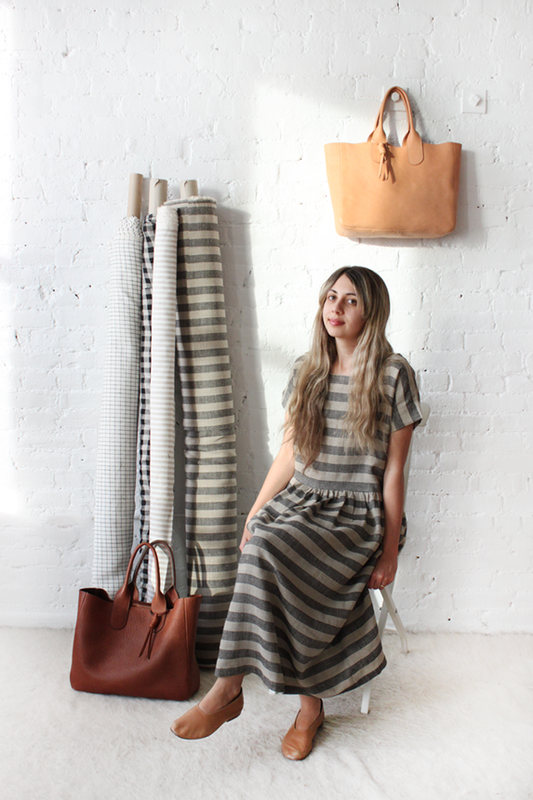 Julia Okun is the creative mind behind Rennes, an accessories and clothing label that started in 2008. I first stumbled across Julia's work a few years ago after a long search for a lambskin pouch. Since then, I've owned a few of her products including a duffel bag, a tote and a linen dress. 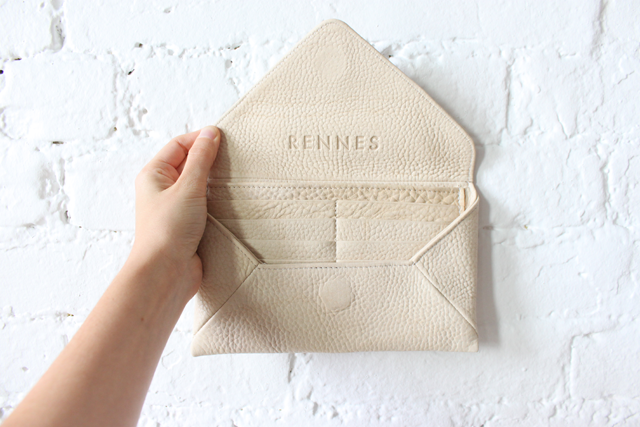 I recently received several emails regarding the quality of Rennes bags and general production queries. I thought it would be apt to let Julia address these questions while providing us with further insight into how she creates her products and the standards she sets for them both in terms of aesthetics and sustainability. An ongoing theme on Assembled Hazardly is minimalism, environmentalism and sustainability. Tell us are you a minimalist and or an environmentalist? How does that influence your work? I know in recent posts you've talked in depth about minimalism - for me there are two kinds : one is a current aesthetic trend. The second I equate with being an environmentalist : you think about your impact on your surroundings. The two can overlap, but often minimalism (the trend) is a masquerade of tricking yourself into thinking you are environmentally conscious by buying "simple" two hundred dollar tee shirts. Currently, I can’t claim to be an environmentalist. But that doesn't mean I don't try. My point of comparison is my husband. He hates shopping and tells me he would rather watch paint dry than shop. Aside from finding it boring, he would rather have four shirts, three pairs of pants, one pair of shoes and wear them until they fall apart. There is no value to him in owning more than that - and to me, that is minimalism. As much as I strive to be like that, I know I will always find something I like, something I have to have. With that said, I do believe in quality over quantity. In terms of aesthetics, I consider my work visually minimalist. When I first started my business 6 years ago, I could not find a bag that didn't have hardware and studs all over it. So my goal became trying to make things without all the extra stuff on them. Walk us through the creation of one of your bags from start to finish. I design in my head, then I make a pattern. I'm not great at drawing so it's better for me if I just make the pattern. After I have the pattern, I make a prototype in cheap leather. At that point I'll figure out which things work and which don't, and tweak the pattern accordingly. Then I will try to make the actual item in the real leather I want to use. I use 8 oz leather for most of my bags. If you start with a thick leather you can always thin it down. If you thin down the entire pattern piece, it is called splitting. If you only thin down the edges, it is called skiving. I got a skiver about a year ago and it's life changing! It allows me to do many things I wasn't able to before, like double fold the leather for the pouch toggles so there are no raw edges. I want to get a splitter, but they cost between 10-40 grand and require a lot of maintenance- so it's best for me to rely on the factory for that type of work. Once I've made that prototype, I work with the pattern maker at the factory (who is wonderful!) and he works to refine my pattern and makes his own prototype. Depending on how complicated it is, that development work can cost between $1-1.5k. Once the pattern is approved, it is mailed to a place in New Hampshire and they make dies for every single pattern piece of the bag. (A leather die is like a big steel cookie cutter - this is how the leather is cut.) There can be anywhere between 2 to 20 dies for a bag. A die set for a pouch might be around $300, but a die for my duffle bag would be around $2k. These are pre-production costs - so you don’t have any product to sell yet. The factory then calculates the raw cost of the bag (leather square footage + overhead costs + labor = raw cost). When the dies are in, production can begin. First the leather is cut on a huge die press with the new dies. The fabric is also cut this way if there is a lining. Each piece is then individually split and skived on different machines. When people think of a factory, they think everything is done by machines, what they don't realize is all these machine are all operated by skilled craftsmen/women. The components are assembled - either with a sticky double sided tape or contact cement. (You can’t use pins on leather like fabric.) Then the pieces begin to be sewn together- and eventually you get a bag! Do you take into account sustainability, environmental protection and ethics when running your business? For example, where do you source your leather or textiles from, how do you choose the company that manufactures your (duffel) bags and how do you go about ensuring that your suppliers meet your standards? How much input do you have in the tanning process? I try to make my line as environmentally friendly as possible. Fashion itself is a wasteful industry, and a lot of it is hard to get around. Leather tanning is bad for the environment, period. There are many steps in the tanning process that use different chemicals. What many people don’t know is that vegetable tanned leather ends up being treated almost identically as chrome tanned leathers; only the actual preservation step uses tree bark, the rest of the process uses the exact same chemicals. It's sad, but leather isn't an environmentally friendly material. Even if I can’t have direct control in the tanning process, I do source leather from a supplier in California, and the hides I use are tanned in Wisconsin. But, I try to be conscious about my line in other ways - mainly in terms of production. In transitioning from being a handmade line to outsourcing, it was important that my line be entirely made in Massachusetts. So many products are designed in the USA, but then sent overseas to be made because the production cost is much lower (and this is because workers are paid so poorly). I wanted to support and keep jobs in my state and I wanted to know workers were being paid fair wages. I wanted to make sure I could visit my factory frequently (usually 2-5 times a month) and make sure the working conditions were good. I've worked along side the employees at the factory, eaten lunch with them, etc - I'm not a “back-seat designer” who just puts together a tech-pack; I have my skin in game. Speaking of standards, what are those standards? When I have leather hides shipped to the factory, I usually go there within a week to examine each hide to make sure we can get maximum yieldage out of the hide. This means looking to make sure there are not large areas of discoloration, excessive scratch marks, branding, etc. Leather is sold by the square foot, and hides are never uniform in shape so you never know what you’ll get. We check things like making sure the dye lots match up and the grain (the texture on the leather) is mostly uniform. Speaking of grains, I like when leather grains don’t match up and I think it makes for an interesting product. This wallet has card slots that have larger pebbled areas and smoother areas, and I enjoy that contrast. However, my factory disagrees with me: they insist on matching the grains closely and are perfectionists about it, even when I tell them I like it the other way! What do you feel are the obstacles you face when trying to produce a more eco-friendly product? Very limited resources. Since it is ethically important for me to produce domestically, there are very few factories that have all the equipment and machines needed to produce leather goods, and when you do locate a factory, chances are they are very busy and if you are small you won’t always be a priority. Also, if you are a small company only ordering 20 of product X, you are going to get charged more per product than a bigger company ordering 1,000 of product X. In terms of materials, the more eco-friendly a material tends to be, the more expensive it is. The more expensive materials you use, the more the product is going to cost for the customer. All customers have a sense of perceived value, but often times that value doesn’t match up with domestically made items. We need to re-think how much things should actually cost. We have gotten used to paying sweat shop prices, and because of that we consume so much more. How do you price your bags and can you explain the reasoning behind the recent price hike? The first model is that products should be purchased through a third party in brick and mortar stores: These stores buy products at wholesale costs from designers. The designers purchase these items at raw cost from the factory. Let’s say the raw cost of a button up shirt is $75. The designer will pay the factory for this shirt, and then ideally mark it up 2-2.2X to get the wholesale cost. So this shirt’s wholesale cost is $165. This mark-up is to cover the designer’s time, overhead for office space, employees, etc. Then the retailer buys the shirt for $165 and marks it up 2.2-2.3X. The shirt then costs the customer $379. Different designers will offer varying suggested retail prices, but often a brick and mortar will decide their own mark up based on their overhead costs. So at the end of the day, the store ends up making the most profit per item, assuming the item isn’t discounted in a sale in this specific example. In short, a product gets marked up 4-5 times before it reaches the customer. All of the sudden you don’t need to have a brick and mortar store to sell your items! You can sell online! People, like me, cut out the middle man and become their own sweatshop. We design, sew, and sell all of our product. We try to fill wholesale orders to get our brand name out there, but in doing so, cut our profit margin considerably: taking wholesale orders when you make everything yourself makes no sense economically because one person can only do so much labor. But, stores are happy because they are getting handmade products at much better price (remember, the factory is being cut out!). You have spent 6 years designing, sewing, and selling all of your products. You need help, you can’t fill orders on your own, so you find a factory to outsource your production to. Since you’ve added the cost of having a factory, you now pay $200 to the factory for each bag. You used to make this bag yourself and sell it for $400. You want to be able to do at least a 2X mark up from the raw cost. Your brand needs to be carried in brick and mortar stores to grow, so your MSRP will need to go up. Your wholesale cost is $400, the brick and mortar store does a 2.2X mark up and the retail cost is now $880. Your current customer basis is sad, but now they can actually see your products in person in shops, something they’ve been wanting to do since you started your business. Since you’ve added the cost of having a factory, you now pay $200 to the factory for each bag. You used to make this bag yourself and sell it for $400. You want to be able to do at least a 2X mark up from the raw cost. You don’t want your customer to experience a price increase, so you decide to never wholesale your items to brick and mortar stores. Your customers will only be able to purchase online, and it will be more difficult to raise brand awareness in the long run. Brands like Everlane are using a model similar to C - they are only selling directly to customers and not to brick and mortar stores. I love when they added the transparent pricing flow charts to all their products recently. People in the industry never publicly reveal these things and customers rarely see how much the retail store are making in mark ups. I’m not saying retail stores have it easy, but I think it’s rarely acknowledged how little the designer actually makes. With all that said, when you are trying to grow your business and have limited start up capital, the best thing to get your brand out there is sell your product wholesale and have your line in a store. Unless you have access to large funds, it is hard to start a business model as great as Everlane’s - you need a lot of financial backing to do something like that - and many online ventures go under quickly. First I’ll point out my mark up from the raw cost - it’s 1.8, much lower than the industry standard of 2-2.2. I keep that as low as possible to let the retailer mark up the product more than 2X - I’m suggesting a 2.1X mark up. This is a low mark-up for a retail store, but if I suggested the normal 2.3X mark up it would end up being an $890 bag. There are many things I could do to change the design of the bag to make the raw cost lower so I can offer a 2.3X mark up, but I don’t believe in compromising quality and taking cheapening shortcuts. I have been slowly increasing prices over the past year to account for being able to wholesale to have my line in stores. The final adjustment I did this past month to account for stores picking up the line this winter and spring - prices need to be the same across the board, I can’t sell the products for less on my website and have them cost more in stores - this kind of behavior upsets retailers. When I think about the bigger picture, it’s unusual to watch a brand progress over six years. The internet has made my line an open book (and I’ve wanted it that way), and people became accustomed to my products costing a certain amount of money. If Rennes was to emerge tomorrow as a new, super cool minimalist leather bag company with prices between $500-$900, many wouldn’t bat an eye because the quality of the new line is taken for granted; the price a new company is charging is assumed to be right if people see hype around it. The price is assumed to match the value. It’s much harder for people to accept a price increase as an increase in value. How do think a Rennes bag differs from the products by other American-made leather companies and what gives it that special edge? I try to always use the best materials I can find even if I lose money doing it. I use Riri zippers for all products now and the cost is so high I end up eating it. Each zipper costs $4-6 and on top of that there is a hefty 20% import tax and shipping! I hope people can notice the difference. They run so much smoother; trust the Swiss to make high quality machineable parts! I’ve looked at a lot of other zippers on bags out there, and most people use YKK, or YKK Excella or Everbrite (which are definitely better than standard YKK). Still, the Riri ones just look really classy. I just picked up a pair of boots in a shop yesterday, and they were $1200 with the cheapest brass YKK zipper for a closure. Seriously, what’s up with that? Another difference is linings; most bag lines use cheap cotton canvas, or don’t line bags at all. I think canvas often doesn’t sit well in leather bags as it’s too stiff. I use linen because it drapes better inside a structured item. It also looks more natural and adds a nice texture. I use folded edges for the pouches, Milo wallet, Duffle bag, and Sophie tote. This uses more leather and takes more work to make, but it will last much longer. Most American bag lines I can think of use raw edges or raw edges with edge coat. Edge coat is a latex and will most likely crack and fall off over time, unless it applied with machine that heats / buffs it as it applies. But, with vegetable tanned leather you achieve a really nice buffed edge with gum tragacanth. I hate branding on the outside of products. It cheapens them. I don’t want to hot stamp “rennes” in small gold letters underneath my zippers. I try to find other ways to add branding that’s more subtle, like the knot toggle. Any chance of suede lined duffel bags? I would love to! Maybe in a few years. Right now I’m trying to keep the prices as low as possible, and something like that would probably add between $150-250 to the retail price. If there is a large interest though from many people, please let me know! You recently included other brands/designers in your online shop. How did you choose these brands and how do they align with your vision for Rennes? I decided to do this for two reasons: I thought it would make my shop more interesting and bring in new customers, and I wanted to raise capital to finance manufacturing my own line. So far it has been pretty successful! I started with just a few lines for this fall. I wanted to pick lines that I liked and aligned with Rennes’ aesthetic: ones that were well made and timeless pieces you could wear for years. For the spring I’m adding a few more - Samuji, Pip-Squeak Chapeau, Ichi Antiquities, Pla, and a few more. What is the fundamental message you want to get through with your design and your work? Take your time and get it right. And, be excellent to each other. What is the one thing you would love to design and make if resources were no object? For me personally : A small home with lots of windows with a small conservatory attached to the house. For Rennes : Expand to make leather jackets and shoes. What are some key things we should be expecting from Rennes in the future? Hopefully more clothing. Ideally I would like to have an entire range of products including clothing and homewares. What is the one singular item from your collection that you would recommend to anyone looking to make their first Rennes purchase? And finally, just so your customers can make an informed decision, David Tennant or Peter Capaldi? The hardest question is always last! David Tennant. He’s perfect at the role as he’s not clearly good or evil, which I think is the best kind of Doctor. Capaldi is a close second. He reminds me of Captain Nemo. Also, from Tuesday, 11/25/14 - Saturday, 11/29/14, Julia is offering Assembled Hazardly readers 15% off the new Milo wallets that are available for pre-order! Enter the code "DOCTORWHO" at checkout. *All images and video on this page provided courtesy of Julia Okun ©Rennes. I was super excited about her bags for a long time but in person, the craftsmanship just doesn't warrant $800+ (the price jumps kind of stunned me bc these are really just not $800 bags regardless of the math involved). Kind of disappointing and heartbreaking, but I've come to realize that it's par for the course when trying to find quality goods. Love the story and design, but really really can't spend the money on things that are just fundamentally lacking in craftsmanship. Can you go into further detail, Anonymous? What is lacking? I'm curious - I'm researching my first Big Expensive Bag purchase, and would like to know what you are looking for/what you noticed in regards to these bags. I thought they they lacked a certain amount of refinement and seem a little amateurish. Not in a whimsical way (you know the rules of construction but are breaking them) but rather in an unschooled way (you just aren't a super pro leather craftsman). The corners, the unevenness of the different elements, a lack of precision. Sure one could call it wabi sabi, but it just felt not very serious for a rather serious price tag. In the same price range (though different styling but still relevant for this conversation re: quality), are Lotuff and also Clegg (both American made) and if you compare the quality in the Rennes bags vs either of theirs, there is absolutely no comparison at all. Once I am dropping over $500 on a bag I really expect it to be a lifetime purchase and unfortunately I don't have the impression that these bags are that. HTH. Criticism isn't easy to hear, and I think that's why Amanda and I worked to make this post transparent and open and we are happy to have an open discussion. Anonymous, it would be helpful if you outed yourself. I'm curious if you are referring to pieces I've made myself, or if you are referring to bags that I have had made at the factory here in Massachusetts. The price jump only occurred once I switched to having the items made at the factory, I apologize if this was not clear. While I've worked hard over the years to make things better myself, I admit there are things that I can't do perfectly because I'm not a factory and don't have access to splitters, heated edge coaters, and die presses, dies and re-cut dies. With the factory made items, both myself and the people there have really worked to improve the designs, so I think if you were to compare a duffle I made two years ago with one of the new ones, you would see the differences and improvements. The bags I used to make myself were definitely not $800 bags. With that said, it's troubling to me if you are referring to the new manufactured pieces. There are only a few ways you would have been able to see them- either if you had ordered one off my website or if you visited my booth at a trade show for wholesale. They aren't in shops yet, and I haven't had an in person sale with them. If you have purchased from me and were not satisfied, I wish you contacted me as I'm flexible about returns if a customer is unhappy with the purchase. If you saw the new items at the trade show, it makes me feel bad that you would wait to anonymously say this on Amanda's blog rather than talking to me directly. I think anyone would agree it's hard to know someone is unhappy with you and that that person probably knows you. Yes Lotuff and Clegg bags are well made. Frank Clegg has been running his line for a long time and at one point I think he collaborated with the Lotuff brothers, who didn't have a line at the time. From what I understand, the Lotuff brothers then took Frank's designs and started their line, which is identical to Frank's. It's frustrating to see that happen; Frank seems like a great craftsman but these days all I see are people talking hype about Lotuff, which stinks because they are not their designs. So if anyone is thinking about buying bags from either, get them from Frank! I appreciate her information about leather tanning; I've always wondered how environmentally friendly the process could even made made to be. This makes sense. But of course, I think it's worthwhile to continue to use leather bags - I have, generally, bought canvas/cloth bags and they simply don't hold up the way my friends' leather bags do. I agree with anonymous about the new prices. This was a great interview, Amanda, and I really appreciate Julia's honesty and transparency, but it does seem that many of her potential customers, like me, simply can't justify a $800+ bag, especially when Everlane offers ethically made bags for so much less for the reasons she stated. I had been thinking about buying a Rennes bag but then the prices soared, I had a baby, and it's just not feasible. I also don't think a bag in that price range can compete with the designer bags that target customers who want to brand themselves via their clothing and accessories. It's a lovely idea to have the bags in store but I'm not sure it's viable given the scale of production and the amount of competition in that price point. I don't want to second guess anybody's business decisions but I'd have thought the online business model would have continued to work well and via word of mouth and blogs, her business might have spread. But there again, perhaps bloggers only buy one bag and their followers don't buy enough to sustain her enterprise. I actually like some of her designs more than the Everlane ones. But there are Etsy sellers and others starting out who cater for those of us who want to be ethical but also cannot justify spending more than $350-400 on a bag. Moya, thank you for your very insightful criticism on why Julia's new prices might not work for everyone. I just wanted to throw it out there (and Julia can correct me) that you're paying mostly for the proprietary design, and the fact that the leathers are sourced, tanned and finished in the US of A. Yes, Everlane makes their totes in Italy and *some* people have had good luck with it, but as someone who has handled many bags including the Petra tote, Mansur Gavriel, Clare Vivier, Celine and even J.W. Hulme etc., I can say that there really is nothing like the bullhide leather on a Rennes bag. Do I think $810 is expensive? Absolutely. I was actually slightly shocked when she raised prices by over 15% but after reading/asking about her business plan, I feel that's the only route Julia could take in this current economic environment. I think it's only natural for a business to expand into a tangible presence instead of existing as an online only entity. I won't be surprise if Everlane decides to open a store in the next few years when they can afford to. The only reason I'm a little hesitant about Everlane's business model is that it seems like the quality of their products vary from batch-to-batch and also, yes, they state how much each item costs and give you a vague idea which factories they were made in, but for the life of me, I can't figure out what the ethical standards are. Factories in Italy are notorious for hiring illegal immigrants or sourcing most of their products from Asia and passing it off as Made in Italy when it's actually just finished in Italy. I've ordered some of Everlane's other products like tees and sweaters and find that often, I can get similar quality from a J.Crew final sale product for an equivalent price or less. I think the most valid criticism at this point for Julia is that she may be pricing her product out of reach for a lot of people that naturally veer towards independent designers. Unfortunately, the cost of raw materials and labor is going up and it's always hard to find a price that benefits both the consumer and entrepreneur. I personally think that an incremental increase would maybe have been a better way to go about this to give people more time to digest, although I suspect that she may not have had enough leeway/time to actually do this. rennes fan here! and yes, i was also kind of shocked by julia's price increases, but having dealt with her personally, i always appreciate how incredibly transparent she has been with her pricing and the actual amount of work that goes into crafting her pieces. 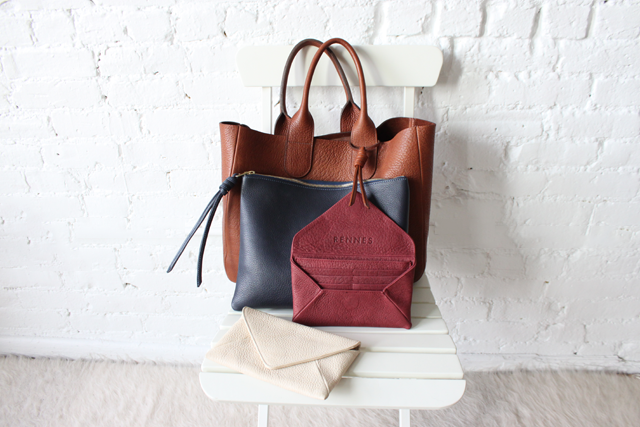 i have a beautiful red duffle bag and a gretel tote from her; both are made of the bullhide. it's an incredibly beautiful leather with a heavy, durable hand to it. i do think the prices are justifiable, but YES, they are expensive. i had a clare vivier duffle and sold it in favor of the rennes model because it was just better made. at the time of purchase, it wasn't double the price of the CV one. and i do understand that $800+ is super expensive--it is for me, too. i guess i'm not sure what the alternative is for someone who has built their business up from the ground and now wants to expand. personally, it means more to me to be able to have a more intimate relationship with the maker of my pieces, and the owners of independent stores, than for me to own something by a face-less luxury brand. and sometimes it takes saving for many, many months in order to make a purchase, but i do think it's worth it. and in the case of rennes, i think the quality is definitely there. i haven't had the best of luck with everlane, but i understand why it's often the crowd favorite. I can't describe how much I enjoyed reading this - both the Q&A and the comments. It's the kind of candid stuff about garment manufacturing you can't even find on news channels and so refreshing to read something like this versus all the corporatised, vague pronouncements about CSR and ethics on most fashion labels' sites. Thanks Amanda for asking all the right questions, and Julia for being an interviewee I can only dream of (candid and insightful)! The line about the environment impact of leather items was extremely sobering and will definitely be a factor the next time I consider whether I need a leather item of any kind. It's kind of like when I discovered the environmental impact of producing denim and making distressed denim. I think it generally surprises people how much one needs to shell out for work done by independent designers who produce in limited quantities - and unfortunately while we lump into independent, smallish labels into one category, it seems the resources available to them are vastly different and that in turns mean one can't really compare them like for like. And the business model comes into play as well. At the same time, whether something is "worth" the price is pretty subjective - and especially so when consumers are also motivated by different things and give different issues different weightage. I think this makes it pretty hard to judge solely on quality when we're looking at bags in the $500 to $1,200 category - because there are so many trade-offs involved. I think in that sense the personal touch and the values of the brand/designer becomes more important than ever to engender trust from the buyer. I can also understand Julia's desire to sell in physical stores - I can't bring myself to buy one of her dresses online (tempting as it is) because the style isn't something I can buy without trying it on in person and I hate dealing with returns. As both a consumer seeking to be more conscious as well as a potential designer looking to develop my own line of (not leather) bags in the future, I found that the transparent description of her design & production process (and business models) very helpful. I respect her commitment to doing her best to keep her line sustainable. I would totally purchase on of her bags if not for the fact that I'm vegan and don't use leather. Thanks to amanda & julia for this very insightful & inspiring interview.